What does a little Bay Area beer coaster have to do with a research-based 1998 NASA space mission? It all started with a NASA astronaut. Captain Altman and his crew were regulars at the Tied House microbrewery in Mountain View, located just a few miles from nearby NASA Ames Research Center at Moffett Federal Airfield in California's Silicon Valley. 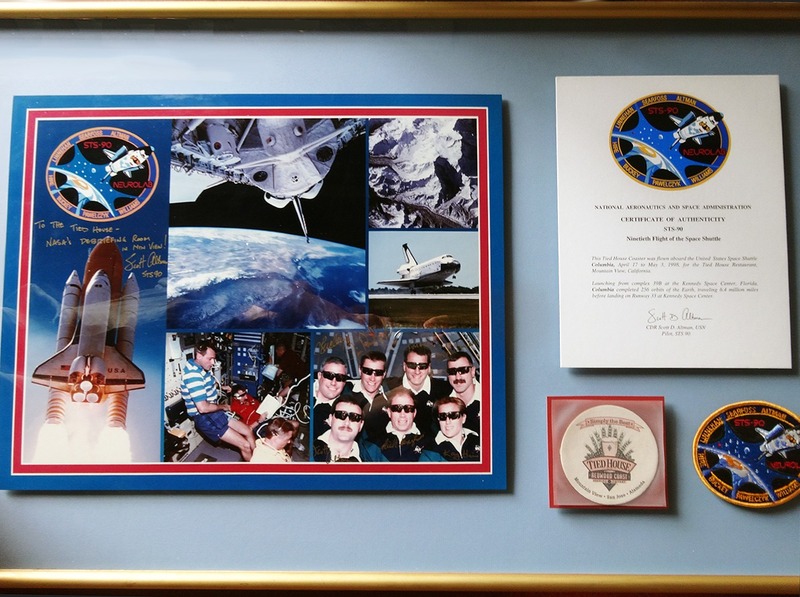 In fact, they loved the Tied House brewery so much that in 1998 they decided to bring one of the microbrewery's beer coasters with them on their STS-90 mission on the space shuttle Columbia. The little Tied House Brewery coaster spent 15 days and 21 hours in space and traveled 6,200,000 miles (10,000,000 km). Today the little coaster hangs proudly on the wall of the Tied House microbrewery back in Mountain View. A Certificate of Authenticity signed by Captain Scott D. Altman tells the story of the little Tied House coaster. The mission took place from April 17th to May 3rd, 1998. After successfully launching from complex 39B at the Kennedy Space Center in Florida, Columbia orbited Earth an impressive 256 times and finally made a smooth landing at Runway 33 of the same NASA space center from where it was launched, and at its scheduled time. The story of STS-90 is an interesting one. 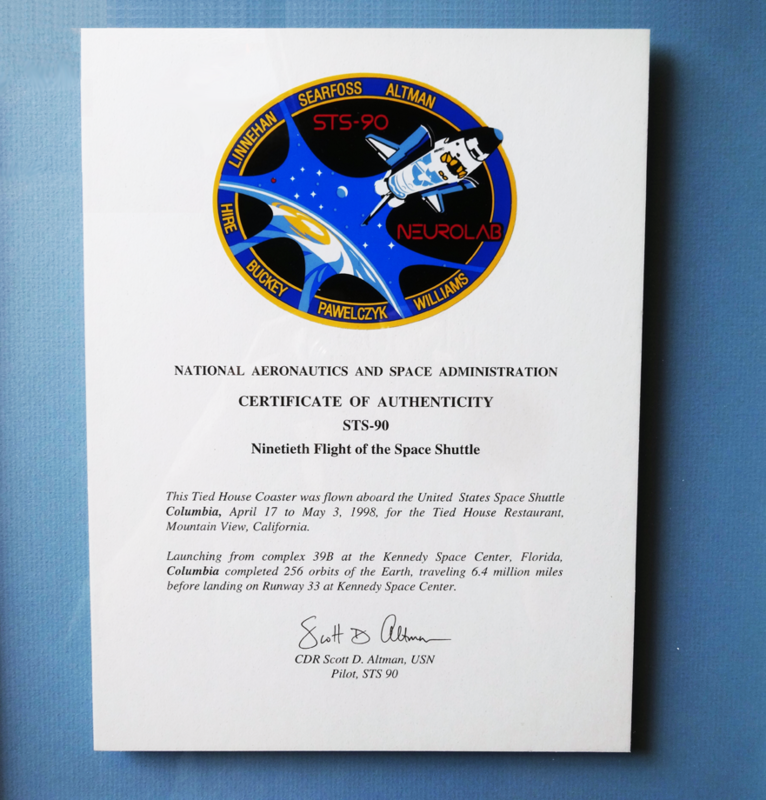 The purpose of the Columbia mission was for NASA's 26 Neurolab to conduct research in the field of neuroscience. The lab's objective was to study and log the functionality and development of the nervous system - one of the most complex and least understood parts of the human body - in outer space. The mission was a cooperative effort between NASA and the space agencies of Canada (CSA), France (CNES) and Germany (DARA), as well as the European Space Agency (ESA) and the National Space Development Agency of Japan (NASDA). Besides Captain Altman and his crew, fish, mice, rats, snails and crickets all served as a diverse group of test subjects. The research went smoothly, even though a postponed launch date, an insecure shuttle valve and the threat of poor weather conditions - which made an extra day in space impossible - could have thwarted the entire mission and disrupted NASA's important scientific research. 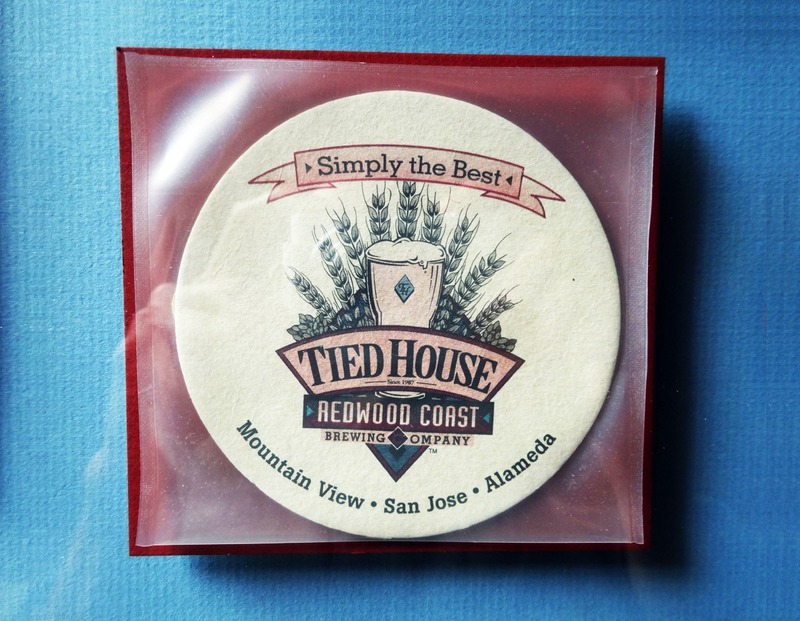 The Tied House coaster is displayed in a protective plastic sleeve. The NASA crew returned home safe and sound that May 3rd, along with the beer coaster. This piece of history was then hung on the wall of Tied House, securely framed to keep it protected along with its Certificate of Authenticity. Something as simple and unexpected as a small beer coaster from a Bay Area microbrewery quickly became not only an important part of United States history, but also an artifact of space travel and science. 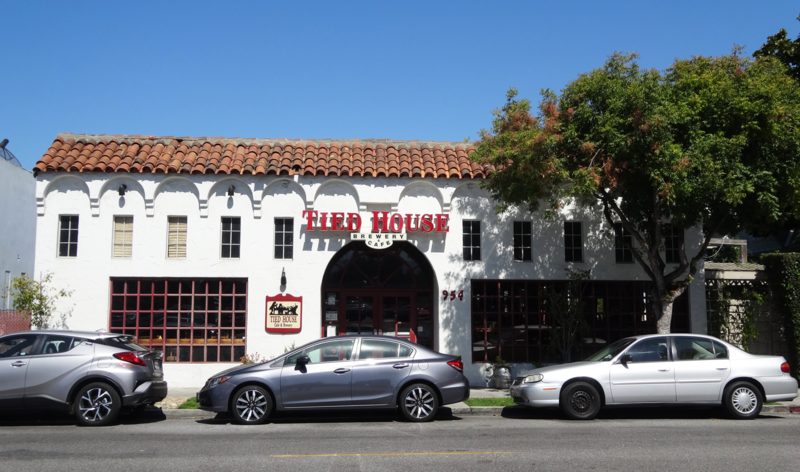 The Tied House was founded by Lou Jemison and Andreas Heller in 1988. The brewery is Located in Mountain View, next door to Facebook and the Google Campus, right in the heart of Silicon Valley. Tied House brewery in Mountain View, CA. The brewery offers 24 craft beers bottled in house and an extensive menu of food. The restaurant is open every day and serves three course meals inside and outside on the garden terrace.